Vanderbilt University's Department of Chemistry offers a highly competitive graduate program in a collegial atmosphere that nurtures individual goals, fosters innovation and collaboration, and opens doors to a wide variety of professional goals. Our faculty leads a wide variety of research ranging across multiple disciplines within and even beyond the field of chemistry. Brian Bachmann is leading the search for new avenues for "green" drug discovery by combinatorial biosynthesis. Recently, a team led by Jeff Johnston announced a novel method for chemically synthesizing peptides that promises to lower the cost and increase the availability of drugs based on natural compounds. David Wright, who specializes in bioinorganic and biomaterials chemistry, was recently awarded a Gates Foundation grant to develop a field test for malaria for the developing world that required no refrigeration, special equipment or expertise to administer. Vanderbilt's Chemistry Department boasts world-class mass spectrometry facilities. In addition, the department also has a powder X-ray diffraction system, a rotating-anode X-ray diffractometer, X-ray photoelectron spectrometers, a secondary-ion mass spectrometer, laser microprobe mass spectrometer, UV-Vis, FT-IR, and Raman spectrometers, an electronic circular-dichroism spectrometer, high-resolution continuous wave and ultrafast laser spectrometers, a fluorimeter, an oligonucleotide synthesizer, an atomic-force microscope, polarimeters, a surface area and porosity analyzer, and a high-resolution thermal gravimetric analyzer. Vanderbilt students also have access to cutting-edge research facilities in other departments at the university and medical center. We sponsor individualized campus visits to each admitted student in order to meet with faculty and current students, tour the campus and labs, and get a feel for the city we call home, Nashville. We offer full support to our Ph.D. candidates—through scholarships, fellowships, training grants and assistantships—and provide each student with a travel stipend to subsidize attendance at top conferences around the world. Last year our department received $17.6 million in external funding, 12th in the nation. University Tuition Scholarships are service-free awards that pay all or part of tuition costs. The following graduate awards are normally supplemented by a full University Tuition Scholarship, which usually includes student health insurance coverage: University Fellowships, Graduate Teaching Assistantships, Graduate Research Assistantships, Traineeships, and Teacher Training Awards. Another unique feature of Vanderbilt’s chemistry program is our in-depth rotation system. Every student participates in three five-week rotations in order to gain substantial firsthand experience with the faculty and research underway on our campus. Although many students arrive knowing exactly what they want to do when they get here, the opportunity to do significant work in other areas has allowed more than one student to discover a new passion and revise their plans. In addition, the depth of the rotations provides enough research experience that a third of students have published papers by the end of their first year. Just as our rotations expose students to a variety of fields within chemistry, our program encourages crossover exploration into physics, biology, medicine and other disciplines. Our graduates have gone on to successful careers at respected research universities and private and public sector laboratories, as well as becoming leaders in chemistry-related arenas like science law, policy and industry. 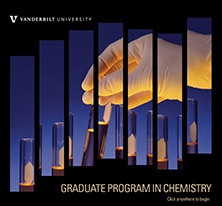 To request more information about our graduate program, please contact us at chemgrad@vanderbilt.edu.